Average roofing shingles prices range between $3.19 and $5.12 per sq. ft. installed, on a typical Ranch/Cape house. Shingle Calculator estimates the total installation cost on a gable / hip roof. This includes: materials (with all other necessary accessories), 1-layer tear-off, labor, dump fees and permits. * Installation includes: Labor, Contractor's Overhead and Profits, based on date from roofing contractors in our Local Roofing Directory. Overhead includes Liability and Worker's Comp insurance, cost of running business, dump fees and building permit, advertising, etc. Profit - nobody works for free, right?! 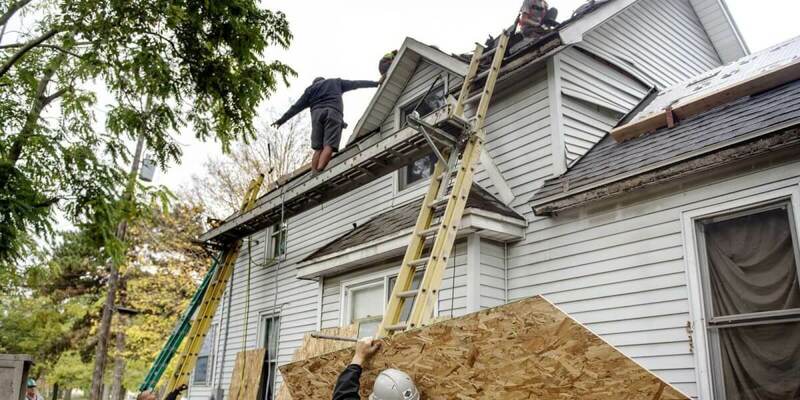 Roofers need to make profit, to stay in business - so that if something goes wrong with your roof, the company is still around to make necessary repairs. Use a measuring tape (preferably 50 or 100 feet long), and get exact ground dimensions of your house. Place the end hook of the tape on the corner and run it all the way to the opposite corner of the house. 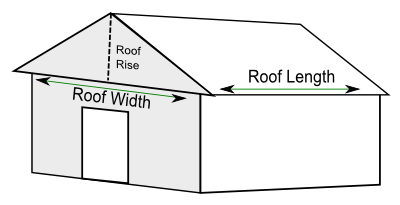 Measure both the WIDTH (gable side) and the LENGTH (eave /gutter side). If you have overhangs on the front, back and sides of your house (you most likely do), take the width of the overhang, multiply it by 2, and add to each side. If the overhangs are not equal width, apply appropriate overhang width * 2, to the respective roof side. If you do not know how to calculate roof pitch, see our guide. To get the slope of your roof based on degrees, roof rise or X inches per 12" run, use our Roof Pitch Calculator. Steep Slope - Roof pitch of 12 or 45 degrees. Note that if your roof has a low slope (below 3 pitch) asphalt shingles are NOT the right material for it. You will need some type of rolled or single ply material, such as Rubber, Rolled Modified Roofing, Rolled Asphalt, or TPO / PVC membrane (best choice, but expensive). Note: Mansard roofs are pretty much "walls" that are built at an angle, and have a FLAT roof in the middle, which is not included here. Only the sloped wall part is being calculated. The RUN of a Mansard Roof is the distance from the top to bottom edges. This is the primary measurement used in mansard calculation, and you need to enter the correct number to get accurate results. Step 5: Click the "CALCULATE" button. In the calculation, we use a 30-year type Architectural Asphalt Shingles and include all necessary accessories and flashing. Waste is calculated at 7.5% for a gable roof, and 15% for a hip roof, which are typical in the roofing industry. Currently, the US national average for Benchmark Architectural Shingles is around $74.51/square or $25 per bundle. If you live in a very expensive area, your prices for materials and labor will be higher than for someone who lives in a small town with a low median income. The highest material and labor costs are on the East and West Coast. Specifically, homeowners living in New England, and large cities, such as Los Angeles, San Francisco, Boston, New York, Washington D.C., Seattle, etc, will be paying to most fr roof replacement or repairs. If you live in the South, you can enjoy the lowest price for both materials and installation. In the Pacific Region (west coast), your cost per square for lifetime laminated asphalt shingles (such as GAF Timberline or CertainTeed Landmark) will be $160 per square when you include all REQUIRED parts and accessories, and waste. And that is for a Gable Roof. If you have a hip roof, the cost jumps to about $174 per square, which accounts for more waste and extra ridge caps that you will need to purchase. If you live in South (AL / AR / GA / KY / LA / OK / MS / NC / WV / TN / TX and parts of Florida panhandle) you will have some of the lowest prices. The exact same materials and accessories will cost you about $114-$124 / per square on a Gable roof, and $127-138 per square for a hip roof. Installation would be $1.64 per sq.ft. for gables and $1.76 per sq.ft. for a hip type roof. This is where things get interesting. The Pacific region is about 18% higher than the National Average. But if we compare it to the South, the difference is even more dramatic! Let's not worry about a hip roof for this exercise. So, if we take the lowest price in the South and combine labor + materials, we get $2.78 per sq.ft. total installed cost. Now, the same roof on the West Coast will be $3.76 per sq.ft. This is a difference of 35.25% (or $0.98 per square foot). Our goal is to provide you with the most up to date and accurate prices for shingles and installation across the US. We continuously adjust the results of the Roof Calculator to reflect the most recent pricing from local and regional suppliers, as well as contractors. We also regularly adjust costs for underlayment and other accessories that comprise a roofing system, and are required during installation. Since roof installation cost can vary by as much as 18% across different regions of the US, there is a Regional Selector Option in the calculator. This enables you to get the most accurate quote for your location. For example, in Boston, MA the cost for Benchmark Architectural Shingles is about $80/square. However in the Mid-West, the same product costs about $67/square. Its an amazing calculator. Such a useful tool estimate the cost for roof shingles. Thanks for this post. This is a pretty good estimator. 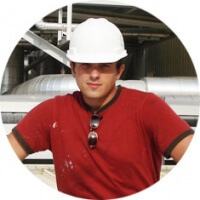 Expect to pay in the high end of the $5.43 – $7.05 per square foot range for a licensed, bonded and insured contractor and for complex or rush projects. Hire carefully, only after verifying prior work quality. For the best value on Shingle Roofing Installation: combine related projects; get bids from several pros; and be flexible about project scheduling. Be prudent. Use all your good sense and judgment when dealing with insurance companies, adjusters, and contractors. Be as cautious as you would be for any other major purchase. I think for asphalt shingles $5-7 installed is a bit steep, but if you (Appleton Roofing) can get it in Wisconsin, by all means. Are the prices for 3-tab or dimensional asphalt shingles? How up to date is this calculator? Prices are for GAF Timberline Lifetime (former 30 years) architectural shingles, and were sourced from Home Depot as well as 3 major roofing supply places in Boston. The results are an average of all 4 sources, and include shingles, underlay, drip edge, ice and water, ridge/hip caps, nails, flashing, ridge vent, caulk, etc … basically all the components of a complete system – as if you were installing a “warranty” job covered by GAF. Also, we update the prices in this calculator on a regular basis, so you can be sure you are getting current market prices. Love the page. Thanks for the helpful info!